It’s official that Pope Francis will visit the country from January 15 to 19 next year. 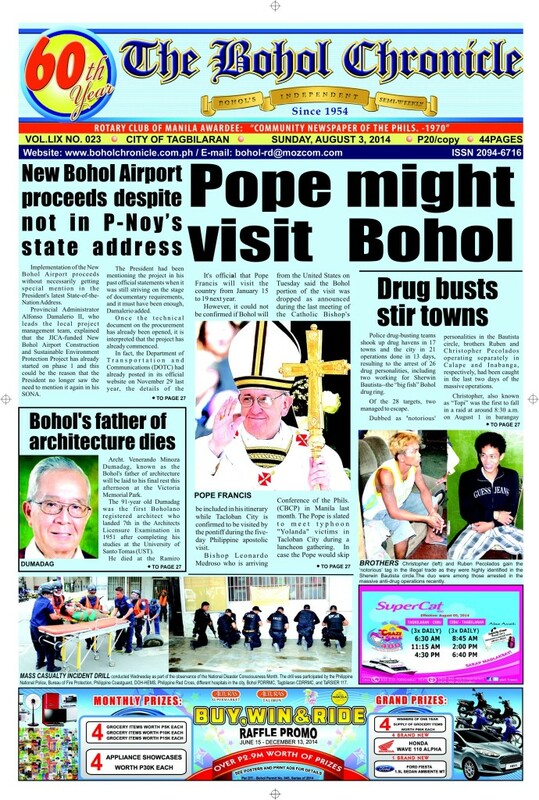 However, it could not be confirmed if Bohol will be included in his itinerary while Tacloban City is confirmed to be visited by the pontiff during the five-day Philippine apostolic visit. Bishop Leonardo Medroso who is arriving from the United States on Tuesday said the Bohol portion of the visit was dropped as announced during the last meeting of the Catholic Bishop’s Conference of the Phils. (CBCP) in Manila last month. The Pope is slated to meet typhoon “Yolanda” victims in Tacloban City during a luncheon gathering. In case the Pope would skip Bohol, Bishop Medroso submitted his proposal that at least five earthquake victims from Bohol be included among those who will have a personal audience with the Pope in Tacloban City. However, with the proximity of Tacloban and Tagbilaran, some church leaders are speculating Pope Francis might still visit Bohol especially that several centuries-old Catholic churches were damaged by the Magnitude 7.2 quake October last year. This alone, can be a point of interest of the Church leader. Earlier advisories revealed that aside from Manila, the Pope will take time to visit the typhoon and earthquake victims, thus raising high possibility that Bohol be included in the final itinerary. It maybe noted that the damaged churches were significantly highlighted in footage of CNN and other international and national media. The parish churches of Loon, Maribojoc and Clarin were totally leveled to the ground while 17 other Catholic churches were partially damaged including the centuries-old churches of Baclayon, Dauis and Loboc parishes. Bohol Gov. Edgar Chatto was also informed by Malacanang about the possible visit of the Pope here. However, no details have yet been confirmed until yesterday. Manila Archbishop Luis Antonio Cardinal Tagle officially announced the schedule of the pontiff’s visit in a recent press briefing at the Arzobispado de Manila in Intramuros. His Holiness will be arriving in Manila from Sri Lanka where he will also have his apostolic visit from Jan. 12 to 15. The visit of the Holy Father to the Philippines was formally announced simultaneously in Rome and in Manila. The news was officially released by the Papal Nuncio to the Philippines Archbishop Guiseppe Pinto and announced by Cardinal Tagle to the media. Coloma, who was at the press conference, welcomed the news of the pontiff’s upcoming visit, noting that it will mark the 20th anniversary of the World Youth Day in the country in 1995. “The government joins the Filipino people in welcoming the Vatican’s announcement confirming that His Holiness Pope Francis will make an apostolic visit to the Philippines… Pope Francis’ visit marks the 20th anniversary of the celebration of World Youth Day Manila that was presided over by now St. John Paul II. Filipinos will most certainly afford to Pope Francis the warmth of their hospitality and manifest the fervor of their faith as they welcome the first pontiff from South America,” he said. Earlier this month, the Catholic Bishops’ Conference of the Philippines (CBCP) asked the faithful to spiritually prepare for the papal visit. “Let us make mercy our national identity. Trust in God’s mercy is part and parcel of our traditional Filipino Christian culture. Let us make the practice of mercy our gift to the pope when he comes to visit us,” he said at that time. “He comes to confirm us in our faith as we face the challenges of witnessing the Joy of the Gospel in the midst of our trials. This is an eloquent way of showing mercy and compassion,” Villegas said. The bishops also encouraged Filipinos to resolve to make an act of mercy everyday such as giving food to the hungry, helping build homes for the typhoon victims, visiting the prisoners, or the charity ward of hospitals, drug rehabilitation centers, homes for the elderly and orphanages.